I love to read and I read a lot. But I don’t much time for personal reading these days; no, most of my reading time is devoted to my son. Since before he could speak, Amy and I have read at least a half hour every day to Jonas. It is one of my favorite things to do. Over the past decade, we’ve read hundreds of books. Most of them have been a bit complex for Jonas. However, we’ve been a firm believer of resisting the urge to simplify language too much when talking to our son (children have a much greater capacity for language than most grown-ups realize). We also believe that teaching Jonas to enjoy stories and books is even more important than helping him with his reading and writing at home. As long as he learns the basics at school, we believe giving him a love for reading will allow him to be self-directed in his growth as a reader (and writer). We take a similar approach to art: instead of urging him to develop better technique, we just encourage him to have fun with art, knowing it will help him to get better and better under his own motivation. Children’s literature is, pound for pound, the most subversive form of literature today. Books written for grown ups can be thought-provoking or challenging or convincing. A People’s History of the United States can help you see history differently. The vastitude that is Noam Chomsky’s corpus can convince you to be a Better Leftist. Reading about Malcolm X or Che Guevara or Dr. King can stir up radical fervor. But being thoroughly convinced of radical things will get you nowhere without imagination. This is where kid lit has such power: the best of it sows seeds of discontent, making you long for a different world. It creates a void that, as you grow older, you can fill with strange subversive ideas. Good kid lit instills a healthy disobedience…a naughtiness that won’t ever except the logic of “because I said so.” Children tend towards impracticality. And the best of children’s literature lets goodness or cleverness or whimsy triumph. Which, as we know, isn’t how the world works. In the real world, you have to get a good job. You have to respect authority. You have to work within the system. You have to be realistic. Kids don’t care about that crap. And children’s lit nurtures such disregard. And sometimes that disregard takes root and never goes away. Yes, Important Books about politics or economics or religion can tell us why things should be different, or how things could be different. But children’s literature makes us wish things could be different. The why and how lack power without that longing. There are a lot of books out there. Many of them stink. Of the ones that don’t stink, few have the sort of philosophical or ethical focus we want to pass on to our child. Thankfully, with a little research, we’ve found a number of excellent books that are both well-written and impart the sorts of insights we want to pass on to our son. These are five books that combine wonderful writing with an underlying message that subverts the dominant narratives of our society. This is the least obvious book on this list, because it doesn’t have a clear radical message. It is the story of a mouse who is approached by three predators (a fox, a snake, and an owl) and he survives through trickery. In each case he tells his hungry adversaries that he is waiting to meet the Gruffalo (an imaginary creature he makes up on the spot). Afraid, the fox, snake, and owl run off. Things get tricky, however, when the mouse meets meets an actual Gruffalo who, incidentally, enjoys the taste of mouse. The book evokes the thousands of folktales that feature a hero who must triumph by using his or her wits. This is an important lesson…there are reasons why this theme proliferates folk literature. In our world, our ability to challenge the system doesn’t come by having the most power. The weak triumph, not by the strength of their arm, but by the caliber of their wits. Honesty is the best policy in relationships of trust, but when dealing with the powerful, I want Jonas to grow up learning how to be clever, sneaky, tricksy, and even dishonest (in the right context). 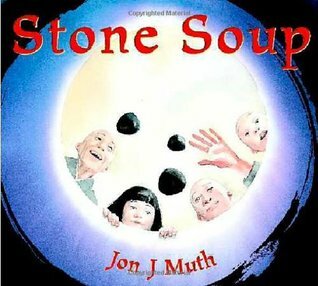 You’ve probably heard the story of Stone Soup–an old folk tale in which hungry strangers trick villagers into sharing their food. While it is an old, oft-told story, Jon Muth makes it his own. Muth’s Buddhism shines through as he re-sets the tale in ancient China. His masterful illustrations (Muth is, after all, first and foremost an illustrator) pulse with wry serenity. It is a wonderful story about hospitality, compassion, community, mutuality, and creativity. Even if I didn’t have a child, I’d own this book. It is a work of art. While not the best of Jansson’s Moomin books, it is (in my opinion) the best stand-alone book and the one I recommend that folks read first. The Moomin books are the sort of books college students in the early 70s would read while on acid. But in a good way. Jansson’s imaginative powers are unsurpassed. Odd characters and strange plot devices make for whimsical reading, but, underneath it all, there is a quiet darkness that reminds you that Jansson is deliberately subverting a world where the Moomins could never exist. 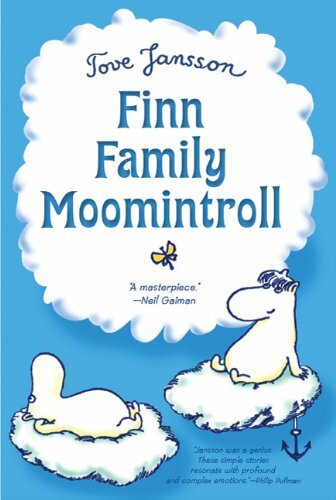 The main character (though, honestly, he’s only the main character in the way Richie Cunningham was the main character of Happy Days) is a sort of white furry hippo that is named Moomintroll. He lives with his parents (Moominpappa and Moominmamma) in big round house (that functions like communal flop-house for any animals or creatures or people-things that drop by) in an wild-growing valley. Moomintroll’s best friend is a philosophical harmonica-playing vagabond traveller named Snufkin. The Moomins tend to be egalitarian (except for a gentle, wise, and non-coercive maternalism from Moominmamma). They tend to dismiss outside authority figures as comical fools. And they reject wealth and power. In one instance, they discover a pile of gold while looking for treasure. They decide to keep it because it would make for pretty garden decoration. Â Children will enjoy it, and adults will find themselves stretched in unexpected ways. If you remain unconvinced, check out 50 Lessons that Moomins Can Teach You About Life. This is cheating, since the Earthsea Cycle is comprised of six books: (A Wizard of Earthsea, The Tombs of Atuan, The Farthest Shore, Tehanu, Tales from Earthsea, and The Other Wind). The Moomin books can be read individually. Earthsea needs to be read in its entirety, much like the Narnia books that came before If I had to pick only one of them, however, I’d go with the first. Le Guin is a living legend. She is a recognized master in both sciene fiction and fantasy. And her books explore some pretty heavy themes: war, gender, shame, violence, anarchism, economics, and more. The Earthsea books begin with a young untrained wizard, Sparrowhawk going to a wizarding school (she wrote it in 1968…long before Mr. Potter began a similar adventure). In his arrogance and pride (he recognizes he is a great wizard but still feels the need to prove himself), Sparrowhawk unleashes a great evil in the world and must stop it before it does irreparable destruction. It wonderfully subverts the notion of a good guy killing a bad guy, since the evil Sparrowhawk must defeat is a shadow of his own making. The rest of the series explores death, power, patriarchy, and xenophobia. It elevates things like simplicity, equality, peace, accepting limits, gardening, community, and working with one’s hands. If any series of books could make you a better person, it is this one. I suppose it is “bad form” to praise one’s own book. Nevertheless, I wrote this book precisely because I felt that there weren’t enough books out that A) encouraged nonviolent ways of resolving conflict while B) telling an exciting story. Most of the books I’ve seen that explore nonviolence are, well, kind of boring. At least for kids like Jonas. Jonas doesn’t want to hear stories about Dr. King or Gandhi (I hope, someday, he will). He likes stories about bandits and ferocious beasts. The book has garnered some great reviews. Kirkus Reviews says it is “a coupling of narrative and illustration that should stoke the imagination of any young modern reader…A visually stunning work addressing themes of peace, generosity, and forgiveness.” And there’s an accompanying children’s album too! I’ve read many other wonderful books to Jonas, of course. Many of our favorites aren’t on this list. 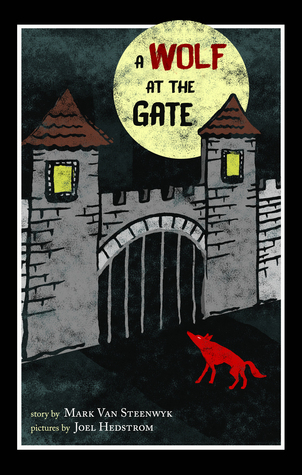 Two honorable mentions are the Prydain Chronicles by Lloyd Alexander, which challenges assumptions about power and nobility and Watership Down by Richard Adams, which though a frightening read unsuitable for younger readers, explores political oppression from the perspective of rabbits.